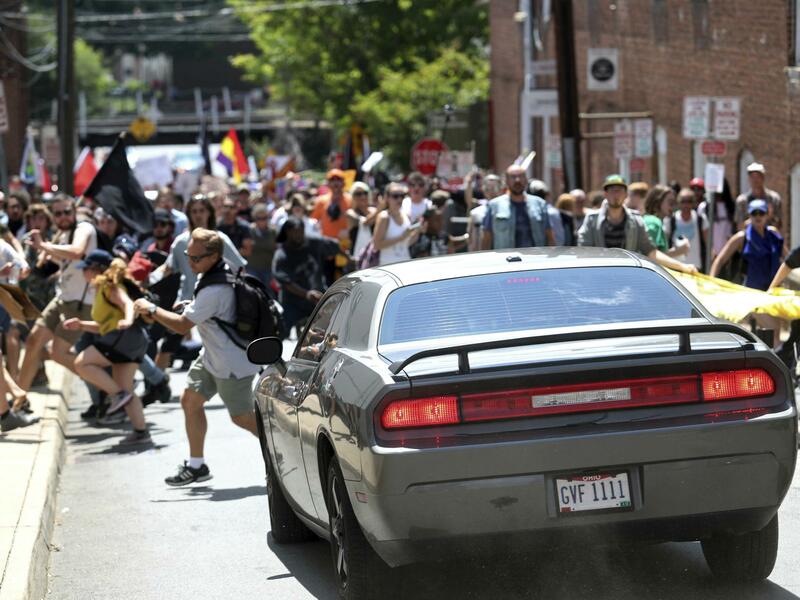 On August 12th, a death in Charlottesville, Va., showed us the danger embedded in our current national divisiveness. We have great need for the transforming truth that the Bible brings to bear not just on personal questions but on how to live together in a pluralistic country. Scott Allen, president of the Disciple Nations Alliance, has seen societies abroad wrecked when one group of humans considers itself superior, or more highly evolved, than another. Allen served with Food for the Hungry for 19 years and now lives in Phoenix with his wife Kim and their five children. He is the author or co-author of several books, including Beyond the Sacred-Secular Divide and As the Family Goes, So Goes the Nation. —Marvin Olasky, editor of World magazine. There is a reason for the increasing division, hostility, and violence we are seeing in America. As a nation, we are abandoning Biblical truth in favor of toxic ideologies that, if left unchecked, will destroy us from the inside. Now, more than ever, the church must embody and champion those profound, transforming truths that have shaped our common life in America from our earliest days, enabling an amazingly diverse and pluralistic society to coexist in relative peace and unity. These truths are all under sustained attack today. A movement is afoot to discredit and replace them with dark and dangerous doctrines. If the church merely stands by quietly while these truths are uprooted from our cultural soil, this nation will inevitably fragment into warring factions marked by bitterness, distrust, hatred, self-righteousness, and vengefulness. As the church, we are here to be salt and light. We do that by living out and creatively championing powerful truths of God’s Kingdom that confront the lies shaping our culture today— truths that lead to human flourishing and social peace. If we fail to do this, we lose our saltiness, the light diminishes, and we are no longer true to our calling to love our neighbors. There are three transforming truths that desperately need champions right now. God creates all people in His image and likeness (Genesis 1:27-28). Therefore, all people have inalienable dignity and incalculable worth. Everyone has God-given rights to life and liberty. All people have unique personalities, gifts, talents, and skills given by God to enable them to fulfill their God-given purpose of stewarding creation, causing it to flourish (Genesis 2:15). All people have sinned and fallen short of the glory of God (Romans 3:23), yet God desires all people to be saved, and come to the knowledge of the truth (1 Timothy 2:4). Jesus shed His precious blood for the redemption of all people. Everyone who calls on the name of the Lord will be saved (Romans 10:13). As followers of Jesus Christ, the dividing wall of hostility is torn down (Ephesians 2:14). There is neither Jew nor Greek, there is neither slave nor free, there is no male and female, we are all one in Christ Jesus (Galatians 3:28). As followers of Jesus Christ, our commission is to make disciples of all peoples, all nations (Matthew 28:18-20). In the new heavens and new earth, people from every nation, tribe, and language will gather in jubilant adoration before the throne of Jesus (Revelation 7:9). Yes, we have differences. Race, gender, age, and physical attributes are important parts of our human identity. God delights in diversity. He didn’t just create one kind of flower, or tree, or dog. He didn’t merely create male— but male and female. He rejoices in the vast diversity of His creation, including human diversity. So should we. We should celebrate it, but we should always, always, remember first what we have in common— what unifies us. All of us are of God’s workmanship and bearers of His image. All of us are precious in God’s sight. He gave His one and only Son so that whosoever believes in Him would not perish, but have everlasting life (John 3:16). This knowledge must shape our attitude toward every single person. It is powerful, beautiful, and life-affirming. It fosters peace, harmony, and social flourishing. God delights in diversity. He didn’t just create one kind of flower, or tree, or dog. Here’s the powerful thing: The Biblical worldview affirms both unity and diversity. Today, our postmodern culture values diversity, but not unity. An idolatrous form of racialism or tribalism is on the rise. Human identity is increasingly viewed through the lens of what are now called “identity groups” of race, gender, or sexual orientation. It is increasingly common for people to preface comments by saying, “As a white, cisgender male,” or, “As a black lesbian female,” as if that somehow defines them. “Diversity” has taken on an almost totemic significance, yet we are rapidly losing the ability to affirm what unites us. That is what we desperately need today— a passionate assertion of what unites us as human beings. Ephesians 2:14-16 — For he (Jesus) himself is our peace, who has made the two groups one and has destroyed the barrier, the dividing wall of hostility... His purpose was to create in himself one new humanity out of the two, thus making peace, and in one body to reconcile both of them to God through the cross, by which he put to death their hostility. He came and preached peace to you who were far away and peace to those who were near. Philippians 2:14-16a — Do everything without grumbling or arguing, so that you may become blameless and pure, “children of Godwithout fault in a warped and crooked generation.” Then you will shine among them like stars in the sky as you hold firmly to the word of life. O God, who made us in your likeness, and who loves all whom you have made; teach us the unity of your family and the breadth of your love. By the example of your Son, Jesus Christ our Savior, enable us, while loving and serving our own, to enter into the fellowship of the whole human family. Forbid that, from any pride of race or hardness of heart, we should despise or injure anyone for whom he died. In the name of Jesus we pray. Amen. –Lutheran Service Book and Hymnal, Augsburg Publishing House, 1958, (#50), edited. Reposted from Breakpoint Daily, August 18, 2017, at http://www.breakpoint.org, by Eric Metaxas, quoting Chuck Colson. Eric Metaxas: What is going on in our country? Why all the anger and hatred? As Chuck Colson reminds us, the answer is as old as humanity. In the wake of the events in Charlottesville, a national argument is underway. I’d like to say it’s a national debate, but no one seems to be listening to each other. So, who’s to blame for the racism, identity politics, and escalating violence and on and on? Well, earlier this week, speaking about Charlottesville, John Stonestreet got to the root of the problem. It’s called the Fall. Chuck Colson: For you and me, the answer to that question is as close as our faith, as close as our own hearts. Christians, of all people, should never be surprised at the evil that infects every human being— even the most ordinary of people. A dramatic illustration of this truth took place thirty years ago (1961), when Israeli agents captured Adolph Eichmann, one of the masterminds of the Nazi holocaust, and brought him to Israel to stand trial for his crimes. Among the witnesses called to testify against Eichmann was a small, haggard man named Yehiel Dinur. He had survived brutal torture in the death camp at Auschwitz. Dinur entered the courtroom and he stared at the man who had presided over the slaughter of millions— including many of Dinur’s own friends. As the eyes of the victim met those of the mass murderer, the courtroom fell silent. Then, suddenly, Dinur literally collapsed to the floor, sobbing violently. Was he overcome by hatred? By memories of the stark evil that Eichmann had committed? This is what the Bible means when it talks about sin. In our therapeutic culture, people cringe when they hear words like evil and sin. We’d prefer to talk about people as victims of dysfunctional backgrounds. But there are times when it becomes obvious that those categories are simply insufficient— times when the evil in the human heart breaks through the veneer of polite society and shows us its terrifying face. Romans 7:18 — For I know that good itself does not dwell in me, that is, in my sinful nature. For I have the desire to do what is good, but I cannot carry it out. Romans 7:21 — So I find this law at work: Although I want to do good, evil is right there with me. –Dave Busby, quoted in a speech I heard given by a close friend of his. By Alvin Rogness , Book of Comfort, 1979, pages 100-104. I knew grief when my father and mother died the same summer at 66, but that grief lifted. It was different when our son was killed at 24. My parents’ death left me sad to think that I had no one to write to about the joys of their grandchildren. I realized that now I was on the top rung of the ladder of the generations, and it was lonely up there. I no longer had the luxury of being someone’s child. Twelve years later our Paul’s life was snuffed out on a city street, ten minutes from our home, as he was returning from two years at Oxford as a Rhodes scholar. Accustomed to the reverse flow of British traffic, he stepped in front of a truck. Now I knew a wrenching grief that fastened itself to me like a leech and wouldn’t let go. In my 20 years as a parish pastor I had tried to help others with the pain of such festering grief. Now it was my turn to suffer. Day after day, whenever I wasn’t pressed with duties, I’d think of Paul. Never during his two years in England was I so preoccupied with him. Then, though separated by the Atlantic, I took him for granted. Now, separated by death, he became an obsession. I had my faith. I believed that he still lived, now beyond another ocean. I believed that he was no longer oppressed by pain or meaninglessness or the prospect of death. In a sense, I knew he had “made it” in the fulfillment we all desired. Why then the pain? A horde of questions attacked me. Like Jacob, who had loved Benjamin more than the others, had I loved Paul more than my other four sons and daughter? Were there things between Paul and me we should have cleared up, had we known the end was so near? What had I failed to I do for him? Why should God let a promising young man die? I felt grief and anger and remorse and guilt and loneliness. I cried to God. He came with comfort, but it took time. I had the most trouble with my anger. I resented the words of Job, “The Lord gave, and the Lord has taken away;blessed be the name of the Lord.” I knew the Lord had given Paul to us, but I couldn’t believe the Lord had arranged an accident to take him from us. I found myself angry, not at God, nor at the truck driver into whose path Paul had impulsively stepped. I was angry at the fallen order– in Omar Khayyam’s words, “this sorry scheme of things,” where sin and tragedy and accidents and illness and pain and death can thwart the greater plans of God for his children. I found comfort in thinking that God was inignant with this too, and that in a mixture of love and indignation he had sent his only Son to earth to put in motion a plan that would eventually set things right. I rediscovered a God who suffers with us. Guilt was not a serious problem. I could think of nothing serious that had come between us. Even if there were, I quickly reminded myself of the sweeping forgiveness of God that swallows up all our sins and removes them “as far as the east is from the west.” Paul, now in heaven, and I, still on earth, could chuckle over anything that had marred our relationship, whatever that may have been. Still, I felt it was virtually my duty to grieve. If I didn’t grieve, had I loved him after all? The magnificent picture in Hebrews came most to my rescue. In chapter 11 the writer parades the people who have died in their faith and who now, as victors, are in the celestial bleachers cheering us on. Therefore, since we are surrounded by so great a cloud of witnesses, let us also lay aside every weight, and sin which clings so closely, and let us run with perseverance the race that is set before us (Hebrews 12:1). I pictured Paul in those bleachers, urging me to drop grief and return with zest to the common life and the joy of those around me. It isn’t as if grief ever quite lets go. But now, except for some swift, unexpected moments, when the loss surges in upon me again, the wrenching pain is gone. Some of life’s mirth and merriment may be gone too. But sorrow becomes more like a minor chord in a symphony which, with the jubilant majors, combines to make a rich melody. We do not belabor Paul’s memory, nor avoid it. I occasionally wear his sweaters. We keep his pictures on display. Even his oar is resting against our bookcase, the oar he used in the Henley Regatta in the summer of 1960. It is at Christmas time that we miss him most. There are no presents for him or from him, nor his Christmas letter. We speak of what he might now have been doing. Sometimes I wonder what pain he might have been spared. The passing of time helps, but it cannot fill the empty place. Fell a great tree, and a hole yawns against the skyline. No one ever takes another ‘s place. All of us have a space in existence all our own. Our loss of Paul is indeed well flanked (12 grandchildren have come since his death). Our other sons do not have their mother’s brown eyes and black hair, but they and his sister all reincarnate some of Paul’s exuberance and warmth. Paul sleeps in a little windswept graveyard on the prairies of South Dakota, next to his grandfather and grandmother. But he lives on in the fabric of the many lives he cherished and, I believe, ennobled. And with more than wistful longing, I believe that he lives and works in another part of the far-flung empire over which the Creator rules. I will go to him there. It is in the dimensions i of that empire that grief comes to rest. I Thessalonians 4:13-18 — Brothers and sisters, we do not want you to be uninformed about those who sleep in death, so that you do not grieve like the rest of mankind, who have no hope. For we believe that Jesus died and rose again, and so we believe that God will bring with Jesus those who have fallen asleep in him. According to the Lord’s word, we tell you that we who are still alive, who are left until the coming of the Lord, will certainly not precede those who have fallen asleep. For the Lord himself will come down from heaven, with a loud command, with the voice of the archangel and with the trumpet call of God, and the dead in Christ will rise first. After that, we who are still alive and are left will be caught up together with them in the clouds to meet the Lord in the air. And so we will be with the Lord forever. Therefore encourage one another with these words. Pete was the best mechanic I ever knew. He had worked at the same garage for fifteen years. Business had grown to the point that an additional mechanic was needed. The owner of the company hired Fred, a much younger man than Pete. They had very different personalities. Pete was modest and reserved, while Fred was outgoing, friendly, and gregarious. Fred was well liked, and many people who had appreciated Pete, now began to prefer Fred. Pete had learned that grace was a power that could penetrate deep within his soul, melt his pride, and make him a stronger and better person. When Pete began to pray for grace to help him adjust to this new situation, he experienced some of this power. He decided that he too could, and should, be gracious. In the meantime, without anything being said by either man, Fred was sizing up the situation in his own way. He graciously began to pull back and push Pete forward, thus giving Pete a feeling of security. Pete no longer felt threatened, and he was able to let go of his jealousy. We sometimes call this grace that people show each other common grace. It can flow from special grace, which is the grace that God has shown to us in the person of Jesus Christ, and which comes to us as pardon and power. Frequently, it is in the midst of common grace that we come to know the meaning of special grace. God’s grace is the dynamic which makes change possible when something old is threatened by something new. Romans 1:16a — I am not ashamed of the gospel, because it is the power of God that brings salvation to everyone who believes. Acts 6:8 — Stephen, a man full of God’s grace and power, performed great wonders and signs among the people. Acts 4:33 — With great power the apostles continued to testify to the resurrection of the Lord Jesus. And God’s grace was powerfully at work in them all. (…continued) To say there is the possibility of supernatural occurrences is not yet to define what ghosts are. The usual notion is that ghosts are the spirits of dead people roaming about on the earth— like Lenora. But this is not what the Bible says happens to us when we die. The Bible speaks not of ongoing disembodied spirits floating around, but of the eventual resurrection of the body, soul, and spirit; all together (which sounds much more appealing to me). As for ghosts, the devil could, perhaps, create the likeness of a dead person without the involvement of any dead person’s actual spirit. God could do this also, for some good purpose, if He would so choose; as we hear sometimes when people have dreams or visions of deceased loved ones warning them of impending danger or giving them a word of encouragement. I have read what appear to be credible accounts of such happenings. God, or the devil, would have the power to create such images or visions of people. Perhaps that is what the ghost of Samuel was. We can believe that ghost-like appearances may occur, without believing that everyone who dies immediately becomes a ghost. There is no Biblical foundation for thinking that. So my answer to the confirmation student’s often-asked question about ghosts is: #1) to acknowledge and even emphasize, our belief in supernatural powers of good and evil. This natural world that we see around is not all there is: and, #2), to maintain a healthy skepticism about most of the stories and explanations of ghosts. The Bible just does not give us enough to go on, and neither does research or personal experience. But we do get enough brief glimpses of this supernatural world, and there is plenty in the Bible to affirm the presence of “unseen things above,” (and below), to keep us aware of the possibilities. While the subject of ghosts is not of central importance to our faith, thoughts on these unseen beings, whatever they are, do teach us some things about God’s world. First of all, the thought of ghosts can open minds to a wider reality. We live in a time when many people are eager to eliminate God from every aspect of life— keep God out of the schools, out of politics, out of conversations, and most of all, out of science. In such a world, even a good ghost story can be a reminder of the possibility of unseen realities that deserve our attention. “It’s a ghost,” the disciples cried out in fear when they saw Jesus out on the lake. They were spending time with Jesus, and when you do that, you will get your eyes opened in all kinds of ways to these unseen realities. The disciples saw Jesus walking on water, and knew that was something out of the ordinary. But they hadn’t seen anything yet. Secondly, any Biblical interest in ghosts will lead us into what the Bible talks about much more, angels and demons; those other supernatural beings that appear hundreds of times in the Bible, far more than ghosts. And the Bible tells us these angels and demons are forces for good and evil that attempt to influence us all. This world is not, as we might like to think, a playground. Rather, according to the Bible, this world is a battleground, and we are in the midst of this battle between God and the devil, between right and wrong, between choosing to do evil, or, choosing to do good. We are in it, and we feel it— every day. We can feel the temptations to do wrong, and, we can feel the reminders and the nudges to do what is right, just as surely as Jesus himself was tempted by the devil and strengthened by the Holy Spirit. So perhaps when you are tempted to do something wrong, or, are inspired to do something good; perhaps then there is a demon whispering in your left ear, or an angel whispering in your right ear, as my mother used to tell me. There are unseen forces for good and evil that are seeking to influence your will and your choices; if not by whispering in your ear, then in other, very real ways. That is a good answer. It acknowledges the presence of the supernatural, perhaps sometimes in the form of ghosts, but certainly and most importantly, in the existence and power of God. It is to that supernatural being, who is our kind and heavenly Father, that we can turn to for comfort and protection and hope. As for the supernatural forces of evil, the devil and whatever assistants he has or methods they use, we need not fear them; but neither ought we fool with them. Most Christians, in most times and places over the last 2,000 years, have had an awareness of the daily blessings and dangers of the supernatural. We would be wise to also be aware. Ephesians 6:12a — For we are not contending against flesh and blood, but against the principalities, against the powers, and against the world rulers of this present darkness. I Peter 5:8-9a — Be alert and of sober mind. Your enemy the devil prowls around like a roaring lion looking for someone to devour. Resist him, standing firm in the faith. James 4:7 — Submit yourselves, then, to God. Resist the devil, and he will flee from you. We tremble not, unmoved we stand, they cannot overpower us. Let this world’s tyrant rage, in battle we’ll engage. His might is doomed to fail; God’s judgement must prevail. –Martin Luther, A Mighty Fortress is Our God, verse 3. (…continued) The third, and most important, source of information about ghosts would be God’s Word. Not counting the Holy Ghost, there are at least three ghost stories in the Bible. In two of the three stories, the disciples think they are seeing a ghost, but it is Jesus. The first is the story of Jesus walking on the water Matthew 14:22-33. It is night and the disciples are in the boat. Jesus was not with them. The disciples see something out on the lake, coming towards them and they cry out in fear, “It’s a ghost.” But then the apparition speaks, and they realize it is Jesus, doing another one of his miracles. The other time the disciples thought they saw a ghost was even more spectacular. It was Easter evening– the third day since Jesus was executed and buried. A few people had reported seeing Jesus, just like there were reports at Bethany of seeing Lenora. But just like at the college, the reports were doubted. Then, suddenly, Jesus appeared among them, even though the doors were locked. Luke 24:37 says “They were all startled and frightened and thought they were seeing a ghost.” But again Jesus speaks, this time saying, “Peace be with you. Why are you troubled and why do you doubt? Look at me, touch my hands and feet. A ghost, does not have flesh and blood.” (Isn’t it interesting that Jesus does not say there is no such thing as ghosts? He simply pointed out that ghosts do not have flesh and blood). Still, it was hard for the disciples to believe, so Jesus then asked for something to eat. He ate broiled fish in their presence, and everyone knows that ghosts do not eat, so that settled it. But these stories, miraculous and as they are, are about people who think they are seeing a ghost, but are really seeing something even more amazing and wonderful. “There is one in Endor,” they replied. “What does he look like?” Saul asked. “It is an old man wearing a robe,” she said. Then Saul knew it was Samuel, and he bowed down and prostrated himself with his face to the ground. The ghost of Samuel then disappeared. The next day, Saul and his sons were killed on the battlefield. What are we to make of that story? Here we have not only a ghost, but also a witch. One isolated ghost story in the Bible is not much to go one, but what is there is not inconsistent with the rest of the Bible. What then shall we say about ghosts? First of all, if ghosts do exist, they are supernatural. Supernatural is defined in the dictionary as ‘something existing outside the natural world.’ We can see, hear, touch, and weigh human beings; we cannot with ghosts. Ghosts are, if they exist, beyond the natural world. As Christians, we do believe in the supernatural. We do believe in the existence of powers above and beyond the natural realm. The Bible says God created the world—God is beyond it, and is free, and able, to work miracles within it. God is a supernatural being, and God is good. There are also, says the Bible, supernatural beings and forces that are evil. There is a devil and there are demons; the Bible makes that very clear. There are, in fact, all kinds of supernatural beings in the Bible, not only God the Father, Son, and Holy Ghost, but also the devil and demons and angels, and even one witch and one ghost, all within the pages of the Bible. We do believe in a supernatural realm. The world that you see is not all that there is. This does not mean that we accept uncritically every ghost story ever told. I never saw Lenora and didn’t think I would. This is an area filled with foolishness, self-deception, hoaxes, and fake news. But as Christians we do not rule out any and every supernatural event. It is a part of our faith to believe in supernatural forces of good and evil. I once read an article about ghosts in, of all places, a respected theological journal. It was written by a man who works in an old library that is supposedly haunted by the ghost of a previous librarian. Other librarians claim to have seen this ghost in action; moving chairs around, knocking books off shelves, and making loud, scary noises in the night. The article is a serious reflection on the possibility of such a haunting. The writer says he is often asked by children if the library really does have such a ghost. I’ll tell you his answer later. I can believe that many children ask about the ghost. Thinking back to all the years I taught confirmation classes, that is perhaps the one question I was asked most of all. “Do you believe in ghosts?” they would always ask. This curiosity is fed by a steady stream books, movies, and television programs about ghosts (some of which are really good). And, the question comes from a natural human curiosity about all things strange and supernatural. So how do I answer these curious confirmands? I will tell you later. How about you? Do you believe in ghosts? You should believe in at least one ghost. Every single Sunday morning in church, everyone used to say in the Apostle’s Creed, “I believe in the Holy Ghost.” Now we say, “I believe in the Holy Spirit,” which is a probably a better translation for today. But for many centuries, the New Testament Greek word ‘pnuema’ was translated sometimes as ‘spirit,’ and oftentimes as ‘ghost;’ in the Bible, in the prayers of the church, and in the Creed. But that is not really what the kids are asking about. What they are wondering is if there are any other ghosts. And the answer to that question is related to our belief in the Holy Ghost. But I’ll get to that later. We should begin by asking where we might look for an answer to this question about the existence of ghosts. I suggest three possible sources of information: books on the subject, personal experiences, and, most importantly, the Bible. I am not an expert on ghost research, so I cannot tell you much about books on the subject. I read a few books on ghosts when I was in junior high school, but not many since. I do know from looking around in bookstores, which I often do, that you can find books that say there are ghosts, and books that say there are no ghosts. I will leave it at that. The second possible source of information would be personal experience. 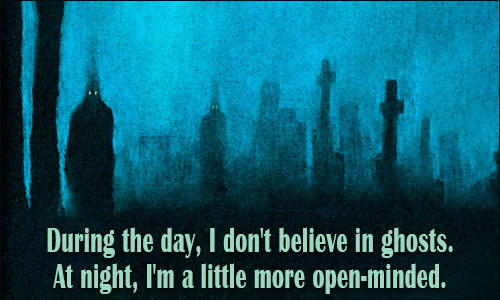 And I have heard some pretty convincing ghost stories from people I trust and believe. The best one was told by my grandfather. It happened before he even owned a car, so probably sometime before 1920. On a dark, stormy night, (when else? ), grandpa was on his way home from town in his horse-drawn buggy. Not far from his farm, he was surprised to see a lady standing by the side of the dirt road. It was storming, so he stopped and asked if she needed a ride. She said nothing, but ‘floated’ up onto the seat next to him. Grandpa was used to seeing people step up into the buggy, so seeing her just glide on up like that made him a little uneasy. After a short distance, still in the middle of nowhere, the lady put her hand up, motioning for grandpa to stop. He did, she floated off of the seat, and then– vanished. My grandfather was a down-to-earth, practical, no nonsense farmer, and this sort of thing was new to him. He did not know what to make of it. So he came to the conclusion that he imagined the whole thing, and decided not to say a word to anyone, ever, lest they think he was crazy. However, a couple weeks later grandpa was visiting with his neighbor and good friend, Arnie. 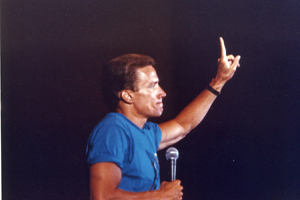 Arnie said to grandpa he thought he was going crazy. Arnie went on to describe to grandpa that very same experience with the vanishing woman on that very same spot in the road. So word got out and then both men would talk about it. Grandpa had no explanation or interpretation. He just told the story. And I have no idea either what that was all about. Also, not far from that road, there was a well-known haunted house with many strange occurrences in the 1920’s, witnessed by many people, even during the day, and, by newspaper reporters. But that’s another story. I had my own opportunity to try and meet a ghost back in the early 1970’s when I was a student at Bethany College in Mankato. The boys’ dorm in those days was the third and fourth floors of the Old Main Building. There was also a fifth floor, which in the 1930’s was the girls’ dorm, but for decades had been used only for storage. It was full of old furniture and dust and spider webs, and looked like something out of a Harry Potter movie. The story was that many years ago a girl named Lenora died on that fifth floor, and from then on her restless ghost had been roaming the long corridors. I lived with some noisy guys on the third floor and we always had friends stopping in. That was fun, but there was no chance of ever getting any studying done. So I asked for, and received, permission to use one of the abandoned rooms on the fifth floor. The room was at the end of a long, dark, hallway; one of the areas that Lenora had reportedly been seen. I wasn’t worried. Even though over the years some students said they saw her, no one was ever harmed; and I did not believe the stories anyway. But I couldn’t help but keep my eyes and ears open when I walked down that hallway. Fifty years ago this summer, Joni Eareckson Tada’s life changed forever. And since then, God has used her transform the lives of countless others. 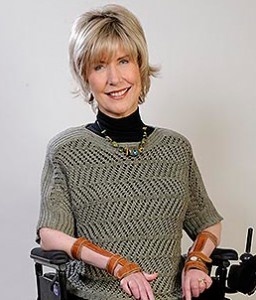 Five decades have come and gone since 17-year-old Joni Eareckson (1949-)—now Tada—dove from a pier jutting into the Chesapeake Bay and snapped her spine in the unexpectedly shallow waters, emerging as a quadriplegic. But of course you probably know that this accident wasn’t the end of Joni’s story. No, it was the beginning … of a beautiful but arduous life of service that has blessed millions around the world. And, oh, what He has accomplished through this one imperfect but beautiful life. Joni, of course, leads the international ministry Joni and Friends, which provides prayer, support, resources, and even camps to serve and encourage families touched by disability, takes wheelchairs to people around the world, and offers books, curriculum, and services too numerous to mention. She’s written dozens of books herself, including “When God Weeps,” “Glorious Intruder,” and “A Place of Healing.” She’s also an incredible artist, a radio host, and even the star of a movie about her own life. But what I truly appreciate and love about Joni is her tireless work to protect and expand the rights of people with disability everywhere. She served on the National Council on Disability when the Americans with Disabilities Act was adopted. She also served on the Disability Advisory Committee to the U.S. State Department and continues her advocacy on issues that touch on the value of life, including health care reform, adult stem cell research, and fighting euthanasia. Part of that advocacy was founding the Christian Institute on Disability to train people and churches everywhere to be advocates too. In 2012 the Colson Center presented Joni with the William Wilberforce Award for her life and efforts. Her friend and admirer Chuck Colson said, “She is a defiant, inspirational, joy-filled rebuttal to those who would assault the sanctity of human life.” Indeed. Despite all she’s accomplished and learned in the school of suffering, Joni’s physical and spiritual challenges remain—and in some ways, even increased. On top of her paralysis, about 15 years ago she began experiencing chronic pain in her hips and back, which was caused by scoliosis from a weakened spine as a result of sitting in her wheelchair for so many years. The doctors told Joni that her bones were too porous for surgery. Then, in 2010, they discovered that she had stage-3 breast cancer—from which she has been pronounced cancer-free, thank God. Philippians 3:8b — I consider everything a loss because of the surpassing worth of knowing Christ Jesus my Lord, for whose sake I have lost all things. I will be joyful in God my Savior. The Sovereign Lord is my strength. “Facing Death, Embracing Life” by Brent Foster (1975-1995), in Finding God at Harvard, ed. by Kelly Monroe, pages 129-132, Zondervan, 1996. (…continued) This notion of good coming out of suffering is, I think, still a hard one to understand. When all the distractions and illusions we create for ourselves in life are suddenly washed away, everything can appear empty and futile. For me, the dreams, hopes, and plans I once had for this world are gone. All that I built for myself has been knocked down. However, I know now that what remains after such a washing is all I really ever had to begin with: my faith in God, and the hope that things are working according to his will. Without God, life is meaningless and death even more so. As Psalm 127 says: “Unless the Lord builds the house, its builders labor in vain.” I think only after realizing this have I begun to understand what Christ really has to offer. Everything I do in life doesn’t have to be in vain, and death doesn’t have to be the victor. Christ offers order over chaos, purpose over futility, hope over despair, and life over death. I hope that all who read this will remember their Creator, “before the days of trouble come,” so that when forced to really confront the horrible abyss of death, as everyone inevitably will, he will be able to lead you back to safety, sanity, and an eternity of glory. Editor’s note: In the spring of 1995 Brent returned home to Shenandoah, Iowa to be with his family. He died that summer. Romans 5:3-5 — More than that, we rejoice in our sufferings, knowing that suffering produces endurance, and endurance produces character, and character produces hope, and this hope does not disappoint us, because God’s love has been poured into our hearts through the Holy Spirit which has been given to us. –John Baillie, A Diary of Private Prayer, 1949. Hebrews 11:23 — All these people were still living by faith when they died. They did not receive the things promised; they only saw them and welcomed them from a distance, admitting that they were pilgrims and strangers on earth.